Hey all! It’s been quite a while since my last blog post. Just wanted to mention that I updated my portfolio with a new project: a Duesenberg Car modeling. 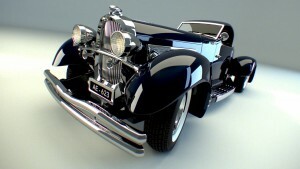 I started this project during the 3ds max lessons I gave. My student wanted to learn 3D, he loves cars so, he went for a sport car, I went to this vintage car to show him how to model and to deal with complexe parts. Didn’t want to make it realistic with scratches etc, I just wanted a clean nice render. Be sure to check the whole project here.